Following its first European sales event in London, Tannus Tyres is coming to the Birmingham-located Cycle Show this autumn. The sales conference was attended by distributors and potential distributors from ten European countries, with Tannus Global Head of Marketing, Takaya Myoshi, providing product information. The conference saw Polish cycle retailer VELOVE Warsaw explained how the tyres perform puncture-free – and how this doesn’t challenge traditional retail sales opportunities, the brand said, with customers spending less time in service and repair situations and have moved spend to additional product. Tannus tyres require a specific fitting method and the brand is developing an approved dealer training programme for the UK. 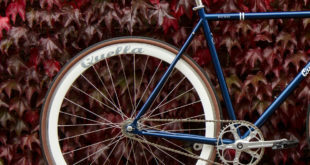 Tannus is distributed from the UK by Brand it Guru, who also bring Chill Bikes to the fixie market.